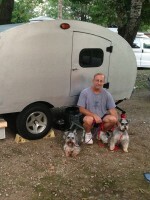 Teardrops n Tiny Travel Trailers • View topic - 110 ??? Getting ready to wire for 110. My intention is to have 2 plugs, one in the kitchen area and one in the sleeper. My plan is to use romex from my generator (like an extension cord) and have 2 plugs on the line. Is this going to be a problem by not having a built in circuit breaker??? I would not use romex for an extenion cord, romex is solid copper wire and will break when bent unlike SO or SJO cord, which is fine stranded wire. As far as a breaker, unless you are making more than one circuit, other than a disconect means, don't see the need if you use # 12 awg wire on your cord and for your romex. That is good for 20 amps, you will be protected by the breaker feeding the circuit you are using, at the camp site or home, or generator. I would suggest that you make the first outlet a GFCI and down feed the second from the first, making both outlets GFCI protected. That's the way I did mine, but there are many different opinions out there. Last edited by Frank on Thu Oct 13, 2005 7:45 pm, edited 1 time in total. Always Include your own Circuit Breaker and always include RCD (residual current detection) I believe this is called GFCI in USA. Regardless of campsite protection always include your own. Circuit breakers are there to protect your individual lines (wires/cables) and should be rated for the appliance ampage that will be used, the campsites CB will be rated at a catch all rate for the entire rating of the supply ie if its a 16 A supply the CB will be rated in excess of 16A. GFCI, many people cant see the point of having another when the campsite pillar as one (assuming codes same as UK regs in this respect) GFCI are Zoned ie the campsite one would need to see an higher ampage before tripping and would trip slower. If the cable is going to be subject to movement ie flexing them multi strand is definately required, if its fixed as in behind walls run to lights and will never move again after fixing in position then solid core is OK. I'm trying to keep the electrical as simple as possible. The generator does have a built in circuit breaker. It kind of sounds to me that you want to use two (2) male plugs on the same cable. Please do not do that. It can be very dangerous. 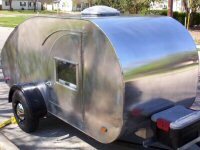 You can make a pigtail to hang out or a mountable male plug on the trailer. Then you can use a regular extension cord from the garage. Seems like the cheapest way to go to me. Is it your intension to have a semi-permenant extension cord running in your TD? If that is what you want then just make sure you use stranded wire in the cord vs any type of solid wire as the vibrations will break the wire. As for a circuit breaker being needed as long as either the generator or the campground electrical supply post has one you wont need another, but if you ever find a post without a circuit breaker on it find another way to hook up power. I finally ran into an RV dealer whose parts man would actually talk to me (a builder, not an RV buyer) and answer my 110VAC questions. He can sell me a 25' shore cable (HD extension cord) with a 30amp plug on one end and stripped wires on the other ready to hook up to my trailer. He suggested getting a "4 inch box" from HD with a 30 amp breaker to wire into. After talking to him, I will wire up my 25' cable to extend out of the side through one of those plastic box inserts with a door. When the cord is not in use it will be pulled inside through the little access door and coiled in a storage compartment. OK initial 30 Amp Breaker, that means you could have 3 KW of heat heating in the cable and causing a fire and the breaker still will not cut off, if your were suffering a 30 Amp shock again it will not break, bear in mind it only requires a few Milliamps to stop your heart. A GFCI could save your life, even if you wont put smaller spur breakers in at least use some residual current detection. Oh Boy...here we go again... George, I thought I had this all worked out. the 30amp main breaker will be located where the shore power comes into the cabin. I will be plugged into 30amp shore power at the camp site and the camp connection should have it's own breaker, and mine is a backup for my trailer's protection. Are you saying I need a larger main breaker than 30 amps? That's the rated power I am receiving from the camp. From my main breaker, the shore power will go to the AD/DC converter where there are 4 AC mini breakers (I'll use only two of them) for the circuits that will go to my front and rear 110VAC outlets which will be GFCI. I won't be pulling more than 20 amps even with a toaster oven (1500 watts/13.6 amps) and A/C (515 watts/5 amps) being used simultaneously, and each will be on it's own 15 amp circuit breaker. That works in my house, why not in the trailer? Of course, my house has a larger main breaker, as It is supplying many more appliances (fridge, freezer, electric range/oven, A/C, TVs (4)Computers (2), lights, power tools, etc, etc.) than my trailer will be. My trailer will only have one or two appliances in use, and they are small ones. Why isn't a 30 amp main breaker large enough? What did I miss this time? cracker39 wrote: Why isn't a 30 amp main breaker large enough? What did I miss this time? Because the campground offers 50 amps? No When you have 30 Amps coming in thats the size of main breaker you need. Next for each spur you should have a breaker set at that spurs maximum so say the appliance run on one spur only needs 10 Amps that spur should have a 10 Amp breaker. It may help if you think of GFCI's as leak detectors. The GFCI compares the current passing between the positive and negative side of the circuit. If the device detects any difference between the two legs, it shuts down the circuit immediately. They are typically used in areas such as kitchens, bathrooms, outdoor areas where there is a higher risk of shock. As others have said, don't count on that 30 amp main breaker to protect you from a fatal shock. The amount of current required to induce cardiac arrest, is many times less that the amount required to trip that 30 amp main breaker. There are several ways to incorporate GFCI protection into your Squidget. In my Cubby, I use a GFCI protected extension cord. You can also get circuit breakers with GFCI protection and GFCI protected outlets. A 30 amp breaker will be fine as long as you use 30A wire, which would be a #10 or better, from the pedestal to your breaker. Just make sure that you have the correct plug for the pedestal end. A 30 amp plug is different from a 20 amp. Then you'll need to use 30A wire from the 30A breaker to your 20A breakers. Use #12 wire from the 20 amp breakers to your receptacles. If you don't want to use GFCI breakers (a 30A is kind of expensive) use GFCI receptacles. To be honest, I don't see a need for the 30A breaker in your trailer as long as all the wires to the line side of your 20A breakers is #10. The only thing the 30A will protect is the short run of wire from the 30A to the 20A breakers. But, NEC requires a main breaker for trailers, FWIW.